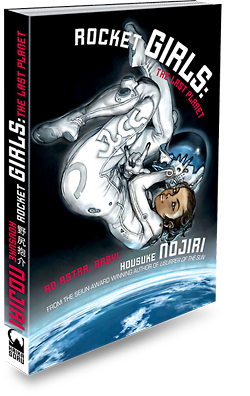 ﻿ ROCKET GIRLS: THE LAST PLANET « Haikasoru: Space Opera. Dark Fantasy. Hard Science. When the Rocket Girls accidentally splash down in the pond of Yukari Morita's old school, it looks as though their experiment is ruined. Luckily, the geeky Akane is there to save the day. Fitting the profile—she's intelligent, enthusiastic, and petite—Akane is soon recruited by The Solomon Space Association. Yukari and Akane are then given the biggest Rocket Girl mission yet: to do what NASA astronauts cannot and save a probe headed to the minor planet Pluto and the very edge of the solar system. Compared to these two, I’m like one of those walking stuffed animals at Disneyland, Norman thought. The two other astronauts looked frighteningly small and thin to the American. Their waists were barely bigger around than one of his arms in the spacesuit. And what’s more, while he looked like the Michelin man, they were shapely. You didn’t expect to see curves like that in the payload bay of a space shuttle flying at 300 kilometers above the surface of the Earth. Their golden reflective visors were up, so she could see their faces—like dolls, he thought. “So it’s in there, just behind the helium tank, right?” Akane asked. Akane was getting used to extravehicular activity by now. In the skintight spacesuit she wore, it was hardly any more difficult than scuba diving. But Yukari was right. Compared to the training video they had seen, the real engine structure had all kinds of small protrusions here and there. This wouldn’t be easy.